Rain is the first parable written by bestselling business book author Jeffrey J. Fox. The parable follows a young New England paperboy named Rain as he learns the business of being in business and quickly becomes the best paperboy in town. 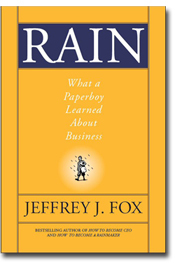 Through a series of humorous poignant vignettes, Jeff illustrates forty "rainmaker" business lessons that can not only be applied to paperboys, but also anyone in business and sales.